This month I finished up my 2012 Year-End Reviews for my Employees. Looking back on the process and my individual conversations with my employees, I came up with a “Recipe for Success” Pie Chart. I’m thinking about using it for my employee’s Mid-Year Reviews for 2013, but I figured I share it on my blog first; as I think this could be of great help to answering one of the most difficult set of questions faced by Managers or Employers from their Employees; that is the questions around “Advancement”. Specifically I plan on using this when an Employee has questions around Advancement either for Promotions or Compensation. Also I want to use this for more junior employees that I feel have the potential for Advancement. 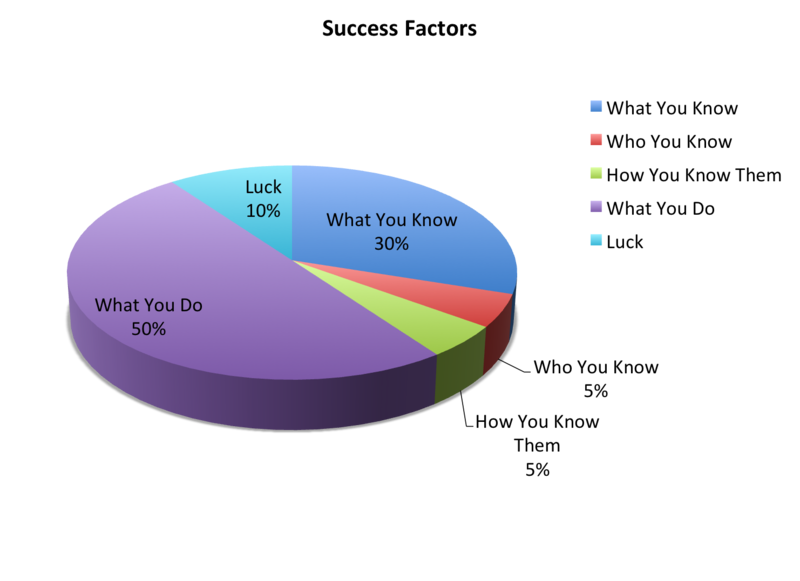 When you see the Pie Chart below in this post, please don’t pay too much attention to the actual percentage values, they are there simply to give the slices of the pie an appropriate portion of what I personally consider the important factors to success. The actual values should not be considered exact in any way, but just as the actual recipe for success is something that is more of an Art than a Science, and therefore even the title of this post is technically incorrect, I think seeing the portion of the pie and how they relate to each other in terms of their size is more accurate of a representation than the actual numbers. I know this might seem confusing at first, but I assure you once you see the graph it will make more sense to you. So what are the Factors of Success? From my personal experience, and yes these factors may vary slightly from person to person if you ask a successful person what made them successful, but I feel in some underlining way, most if not all of these factors have played a role in the success of most people. Note: Lowest Order of Importance is most important; 1 being the most important. There is a 0, however that’s really undefined; you’ll see what I mean when you read this part. This factor represents your Skills, Knowledge, Education, and Experience. As an Educator I know pointed out, I should have/could have listed “What you Learned” as a separate slice of the pie. And he’s right. Actually I wanted to write more about this section before I published it, but hit the publish button instead of save by mistake. Education both from established institutions such as Schools as well as Knowledge gained from personal and professional projects is invaluable. Sometimes I value Knowledge gained from projects both personal and professional over official classroom based education and textbooks, especially in the realm of technology and specifically software development. See my blog post on Education verses Experience. So I have to agree with my friend Donald that “What You Learned” should have it’s own slice of the pie, but I’m being lazy here, if it wasn’t so much work on a Saturday afternoon to edit that damn Pie Chart in Excel and Powerpoint and save it as an image again, I would do it! Everyone will tell you knowing the right people is your ticket to success, in school, jobs, and otherwise. However I feel the next attribute of my Success Pie is more important. Knowing the Right People of course is important, but just the fact that you “know” someone is unimportant. I know people that know CEOs of companies, but those same CEOs wouldn’t give them jobs, because they either lack too many of the other Factors of Success or they are more of an Acquaintance and really don’t know them, or in general just wouldn’t put their name on the line for that person. In my experience, people throw the word “Friend” around too casually. Acquaintance is more appropriate for most of the relationships in our lives; again in my opinion. However you must first know someone before they get to know you and you get to know them. That’s where the next ingredient comes into play. This factor is really the second half of “Who You Know”. As I mostly explained already, simply the fact that you “know” someone is insignificant. It is how you know them or rather really how they know you, that’s important. This includes the depth of information on the professional level, although sometimes for some people even some personal facts are important, but remember TMI (Too Much Info) when getting into the realm of personal facts. A person in a position of power that you want to leverage to help you succeed needs to know that they can trust you. That you will not hurt their own reputation, and that if they give you a task that you will succeed and make both you and them look good. They need to know that you will be a good representative for them. These reasons and others are why “How You Know Them” is more important than “Who You Know.” But again it’s a complimentary ingredient to “Who You Know.” But please remember there’s a big difference and simply knowing someone doesn’t count for much by itself. This is possibly the most important factor of success. Everything up until this point helps you to Deliver. And what you Do or Deliver is the most important thing for your successes in life. You have to Walk the Walk, not just Talk the Talk. Your Skills, Education, Past Experience both Professionally and Personally, Connections, all add up to this moment. This is the moment you take center stage and show to the world you can actually do it; make it happen. What you Deliver is why you get promoted, get more job offers when you aren’t even looking, get the big bonus or that raise, or grow your team and responsibilities. This is when you earn that Pay Check, make it count! Succeeding at a task instead of failing against the odds. Making the right choices in general. Getting the chance to work on the right projects. Getting hired for the right job that will give you the opportunities to gain experience, exposure, etc. Graduating at the right time. Working for the right group or department or company. Going to the right schools. Participating in the right extracurricular activities. Being seen when it counts. The list can go on and on. This is why it’s considered ZERO on my list of ingredients in terms of Order of Importance. The definition of Luck itself is infinite and cannot really be determined. We can list components of what is luck, but really you only need some of them to help you be successful, not all of them. I hear all to often people saying I just wasn’t lucky. Although there may be some truth to this because you might be equally as good as someone else or maybe even better but maybe you missed some of the other attributes of what makes a person successful, or perhaps it really is a missing component that I listed under luck, for example, being at the right place at the right time. I am a Capitalist and I believe in the principals of Capitalism. And my Recipe for Success “Pie” applies only to a Capitalistic Society. I even wear a T-Shirt that says “Capitalist” on the front of it in a baseball styled font. So I don’t believe that we have to live in a Socialist vision of a fair society. Instead I believe to our Government should support Capitalism and Freedom and simply allow for the chance that someone, anyone, no matter where they come from or who they are, can become successful, but that does not mean that any specific individual will be successful. I’m interested if any other managers feel points from this post or my Pie Chart are useful for their own Employee Reviews when an employee asks about advancement. Please feel free to contact me on my contact page or leave some comments. Also I would like to hear any general comments from anyone if they agree or disagree with any of my points, or feel I should even consider adding additional “Ingredients” to my Success Pie.